It all begins with that unexpected window display. You know the feeling. One moment you’re idling along the street on your lunch break, the smell of wet leaves accompanying an autumnal curl of mist in the air. The next you’re confronted with an eye-zapping array of baubles and small mounds of fake snow. It’s October and the ghouls of Halloween are yet to be unleashed but, let’s be clear, this is a full-on Yuletide Alert. You need to be on a holiday footing. Do I have what it takes, you ask yourself. Not just sourcing those perfect gifts for your nearest and dearest. If only it were that simple. More importantly, are you up to the holiday style challenge, to be a class act at a succession of social gatherings. Because that first wintery window display will herald a flurry of invites to a host of parties. Worried? Don’t be! There is hope. And it comes in the shape of the modern slip-on. The men’s loafer is the Christmas men’s shoe for this season. It will be your trusty companion for the holiday events ahead, from the relaxed rendezvous with friends to swanky formal function at work. These Christmas parties may make your heart somersault and soar. But if the very thought of it all leaves you colder than Frosty the Snowman’s carrot nose, do not despair. We’re going to show you how to dress up – from the soles of your feet. The brief – to make you snappier than a quality cracker, sharper than a winter frost. The one thing that will become abundantly clear this festive season is that Christmas parties operate on the bus principle. If you have been starved for socials throughout November then December days will often deliver three at once. This means, of course, that your choice of festive footwear is going to have to balance comfort, style and versatility. So let’s imagine the classic festive trio of events. First up you have the afternoon Christmas office party – think professional. This is swiftly followed by the mini meet up with some mates – time to get casual. Then it’s all topped off by a cultured evening soiree – something appropriate is necessary. Your dilemma is to bring all of these looks together, without the aid of a travelling shoe rack. The answer is the men’s loafer. If you invest in this key piece of holiday shoe style then your festive season is about to get off on the right foot. The modern slip-on will enable you to be seamlessly stylish this Christmas. These men’s shoes possess a combination of design features. The simple silhouette is handcrafted in Italian suede lending it a luxurious and durable finish while the interior matches the exterior in its cosy, cushioned insoles. So not only will your shoes look good, they’ll feel good. And if you’re on your feet all day that’s a gift that keeps giving. 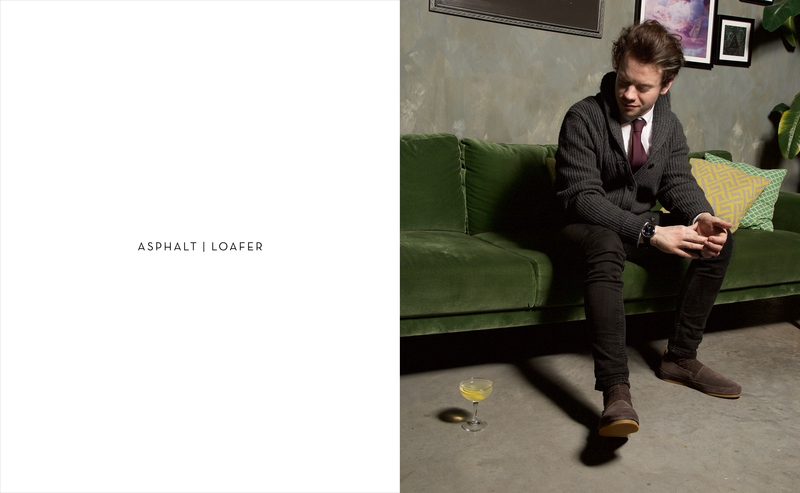 Let’s take a closer look at how the loafer can breathe new life in to your party apparel. Love them or loathe them, the Christmas jumper, tie and socks have made a comeback. They’re all just a bit of fun, but often deliver a very short-term smile. Before you accuse us of Bah Humbug, we’re all for some festive cheer. We just think you can carry it off with a little extra panache. Step forward the crimson loafer. This stylish slip-on boasts a rich red hue to add a splash of colour to any proceedings. By day they’re the ideal mate for relaxed jeans, by night the perfect partner for finely-tailored tapered trousers. So steer clear of garish red and green combos and experiment with a richer, rounder colour this Christmas. Black, states the age-old adage, can be worn with anything. At formal gatherings the neutral shoe is a staple for many a well-worn suit. Safe and steadfast, black has been a tried and tested choice for generations. 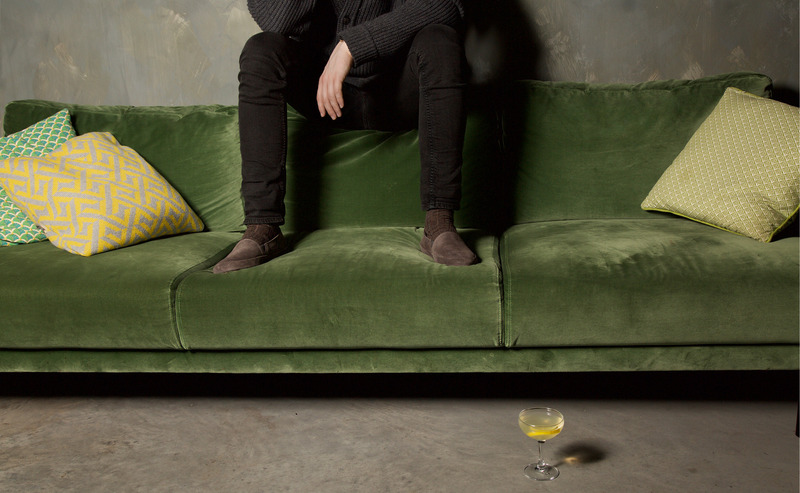 Your goal is to bring a little more soul to the party and that’s where the black loafer comes up trumps. Forget the brogue and its shiny imitators, you’ll impress in suede, modernising a classic look with extra levels of comfort. Simply match these shoes with a clean-cut blazer for the office shindig or a stylish jumper for dates with mates. 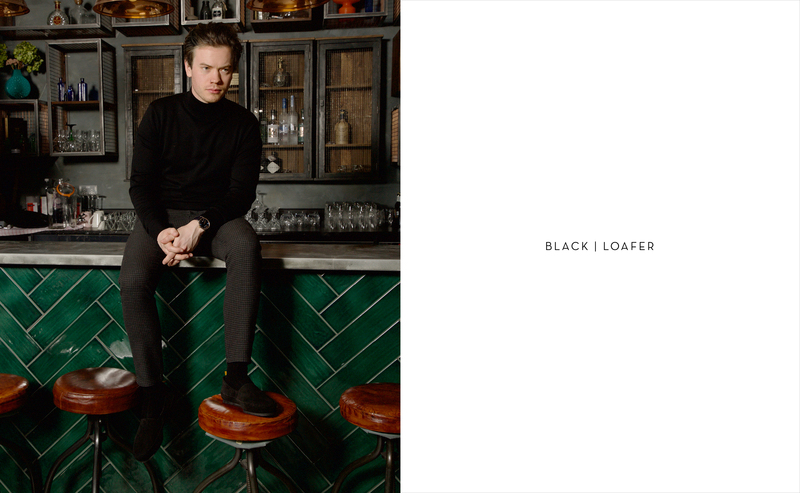 The black loafer allows you to fit the mould while breaking it, bringing a fresh, new take to a classic look. It’s a given this Christmas that lying somewhere between the casual catch up and the glamorous get-together will be a mysterious middle ground. The ambiguous invite! This may pose you a dilemma. If you dress too smartly will it look like you’re trying too hard? If you dress down will they think you’ve made no effort? 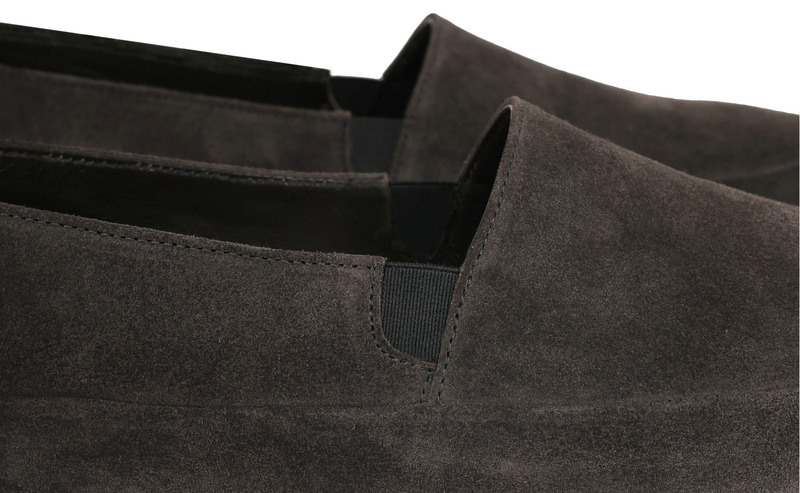 On these occasions, the asphalt loafer in a grey brown suede will be your saviour. They’re the ideal foil for any smart-casual combination, totally on point for fitting in with the chic crowd. So relax and marry their mellow tones with layers of complementary colours or make a statement with a tidy, buttoned-up shirt. Versatility is the key to the asphalt loafer, allowing you to slip on these shoes for evenings and nights of polished perfection. Wherever you choose to roam in your Christmas loafers, we hope you enjoy a season full of festive cheer. 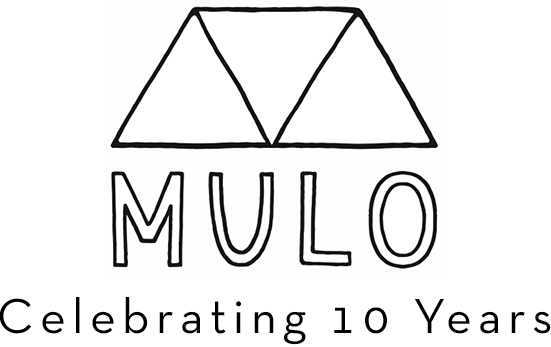 It’s time for you to put your best foot forward in a MULO slip-on, knowing you look and feel the part.